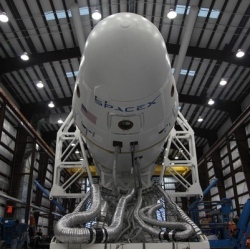 SpaceX says its experiment to bring part of its Falcon rocket down to a soft landing on a sea platform did not work. The vehicle was launched to send cargo to the International Space Station. Once the first-stage of the rocket completed its part of this task, it tried to make a controlled return. The company CEO Elon Musk tweeted that the booster hit the platform hard. "Close, but no cigar," he added. "Bodes well for the future tho’. Ship itself is fine. Some of the support equipment on the deck will need to be replaced." And he continued: "Didn’t get good landing/impact video. Pitch dark and foggy. Will piece it together from telemetry and… actual pieces." SpaceX intends to keep trying. If this kind of capability can be proven, it promises to dramatically lower launch costs in the future. It might also point to new ways of bringing spacecraft back down to Earth in general. SpaceX lofted a Dragon cargo capsule on its way to the International Space Station early Saturday, even though the highly anticipated attempt to land a Falcon 9 rocket booster on an ocean platform ended with the stage smashing into the barge. The primary mission was to place a Dragon capsule in orbit that is carrying more than 5,000 pounds of food, supplies and science experiments to the station and its six-person crew. This was a success. SpaceX could follow as soon as Jan. 29 with another Falcon 9 launch of a government science satellite, and possibly another landing attempt, if the drone ship can be repaired quickly.